Małgorzata Kulbaczewska-Figat discussed with Bogdan Ţîrdea, one of the leading activists of the Party of Socialists of the Republic of Moldova, member of parliament of the Republic of Moldova co-author of Moldova Oligarhică, the first complex study of the oligarchical political system in Moldova, former lecturer of political science in Ion Creangă Pedagogical State University in Chișinau. 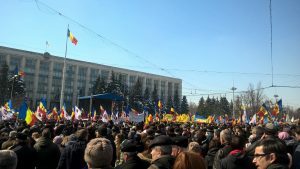 On 25 March, we witnessed a mass rally in the center of Chișinau on the hundredth anniversary of Unirea – ‘union’ of Romania and Moldova, or the Romanian annexation of Bessarabia. Some of the commentators warned that this event would turn into riots or even a direct attack on the Moldovan government, an attempt to force a new ‘union’ immediately. However, nothing of this happened – even the turnout was much lower that the organizers expected. Let me remind that the Unionist rally was supported by ten political parties (from both Romania and Moldova) and about twelve more non-governmental organizations. Moreover, 131 towns and villages in Moldova had signed the symbolic ‘declarations of unity’. The organizers claimed they would be able to assemble one hundred thousand people, so that the Moldovan government would be pressured to start practical work on liquidating its own state immediately. What happened instead? According to police statistics, there were no more than seven thousand in the Square of the Great National Assembly in Chișinau. Even if we consider this data unreliable and multiply the number by three, we do not even get near one hundred thousand. Despite all the money that Romania had put in promoting the idea of a union and in organizing this march in particular. Is the liquidation of Moldovan statehood a serious perspective? We hear that such things are unthinkable in Europe, that, for instance, Germany would protest such annexation on the grounds of international law. But Europe has already accepted the breakup of Yugoslavia or, on the contrary, the unification of the German states. All that after the Helsinki Declaration had been signed and the rule of inviolability of frontiers officially declared. Such changes do take place, and should Romania really take steps towards a ‘union’ with Moldova, neither Germany, nor the European Union would react seriously. As for the United States, they would welcome the annexation. This is the decisive factor, for today no one among the European states would dare to do anything against the US. In the case of Romania, the case is even more clear, as there are American military bases within its borders. What kind of sovereignty does the state have, if there is a foreign army on its territory? If the unionist movement is far from gaining momentum, what means could Romania use? Out of the three million Moldovan citizens, about 800 000 hold Romanian citizenship as well. Every year, five thousand young Moldovans go to study in Romania, getting local scolarships. This is a far more efficient way to prepare ground for unity than the demonstrations that take place on one day. They make already almost two thirds of the entire parliament – we are speaking of 65 MPs out of 101. The Speaker of parliament, Andrian Candu, is a Romanian citizen and so is Vlad Plahotniuc, the leader of the strongest political party and Moldova’s most powerful oligarch. Moldova is effectively ruled by citizens of a neighbouring country. And that is not all. Five out of six judges of the Constitutional Court hold Romanian passports. The Supreme Court – same situation. Information and Security Services, our secret services, also used to be led by a Romanian citizen. Not to mention ministries, which are all packed either with officials holding Romanian passports or with Romanian ‘advisors’. The Moldovan and Romanian governments already organize joint working sessions. In addition, Romania is financing dozens of NGOs in Moldova, TV channels, even an alternative Orthodox Church structure – the Metropolitanate of Bessarabia. Around 700 million euros are being spent on these initiatives. Political influences seem clear, how about the economy? Romania has acquired, for symbolic prices, some of the strategic entreprises in Moldova. Victoriabank, the biggest bank, was bought by the Romanian Transilvania bank this year, which means that the financial sector of the economy now remains in Romanian hands. Romanian TransGaz is now owns the company that is responsible for the transportation and supply of natural gas in the whole of Moldova. Taking control of electric energy will most likely, be the next step. It would not be an exaggeration to say that this influence in Moldova is significant enough to speak of Romanian control. I would even consider calling Moldova a Romanian semi-colony. What then, is the point to hold rallies such as the one of 25 March, if they only turn out to be disappointing for the organizers – and if the actual Unirea is being quietly introduced in other manner? Rallies and marches of the Unionists serve to prepare public opinion for the final act – the formal annexation, similar to the one that took place in 1918. Right now, while we are talking (on 27 March – MKF), a Moldovan delegation headed by Andrian Candu is taking part in a solemn meeting of the Romanian parliament, celebrating the events of that same year. But these are the politicians only. The polls show that the Unionist ideas are supported by no more than one fifth of Moldovan citizens. Not much, right? This must be ‘corrected’. 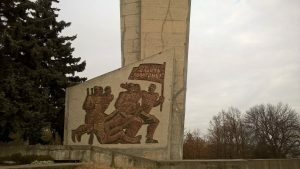 What is the Socialist Party of the Republic of Moldova (PSRM), the most popular party in the country, doing to counter these tendencies? We cannot do much as long as the pro-European coalition remains in power. Only our victory in the upcoming elections, scheduled for November 2018, could give us more space to act. The film also makes an important effort to clarify what happened in Bessarabia in 1918. We hear from the Unionists that it was a happy return of ethnically Romanian lands to the Motherland. But many historians prove that it was actually a forceful annexation, and the following twenty years of Romanian rule should be rather considered as an occupation of Bessarabia. Three major uprisings against Romanian rule took place: in 1919 in Bender and Khotin and in 1924 in Tatar Bunar. All three were suppressed by the Romanian army, with thousands of citizens killed. If everyone dreamed about the union, if then, everyone lived happily in the Great Romania, why did these people (peasants, workers) revolt? Are these facts known to Moldovan citizens? Nowadays our students learn, for instance, that Russia has always been an enemy. In fact, according to this vision, everyone has been an enemy, with the very exception of Romania, the ‘island of Latin culture in the Slavic sea’, permanently defending herself from Slavic aggression, never attacking, never hurting anyone. Such an approach to history and to different nationalities sounds particularly dangerous in a multiethnic society that Moldova undoubtedly is. Unionism as a whole is absolutely rejected by all our minorities – the Russians, the Ukrainians, the Bulgarians, the Gagauz, but also smaller communities such as Belarussians or Poles. All of them remember perfectly what happened after 1918, when the government in Bucharest took measures aimed at national and cultural unification of non-Romanian communities. They also remember well that this policy was, in fact, the most serious effort undertaken by that government in Bessarabia – there were, on the contrary, virtually no measures to fight poverty or illiteracy, no major investments. The ‘happily united’ Bessarabia remained the poorest region of the interwar Kingdom of Romania. Could anything better await us in the case of a new union? Especially if we take into consideration that modern Romania is one of the poorest and most corrupt states in Europe. 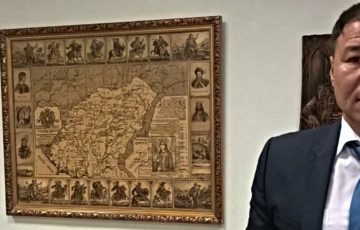 If Romania is already controlling Moldova to a great extent, working on citizens’ identity may be not enough for the PSRM to save the country. What other measures is your party going to undertake after an electoral victory? I would argue that politics in the area of identity and history is, in our case, of crucial importance. And that is why we would get the history of Moldova back to schools and run many other information campaigns on the subject. Secondly, although we cannot ban dual citizenship, we are going to ban people with dual citizenship from holding important posts in state institutions. Such a law would be introduced by the PSRM. Furthermore, we would turn our attention on the economy, we would not pretend not to see that Romania is slowly but surely taking control over strategic assets of our country. Would the new government be able to get back any of these assets which have already been sold? We are going to look carefully on who sold what, on what terms, to whom, were there not any corrupt schemes. In fact, we are convinced that there were. And not minor ones! Many of the transactions took place against the very essential interests of the state, for how could Moldova profit from selling all the crucial state entreprises to Romania, from getting deprived of economical and thus political sovereignty? We are going to analyze all of that, but what could be done and what happens next – it is hard to predict today. It is hard to say on what level social and ethnic tensions would be after the elections. They are still growing. What factors would contribute to that? For instance, the fact that the new NATO Liaison Office in Moldova was opened on 8 December, that our army takes part in joint exercises with NATO forces, and not only exercises – there were Moldovan pilots in Afghanistan, and public opinion learned about that only recently, when some of them were kidnapped by the Taliban. 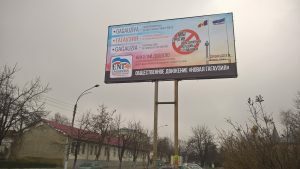 While such military presence is strengthened, some Moldovan politicians make statements about the liquidation of Transnistria. This must be negatively regarded by Russia. Add to this the Unionist initiatives that scare and infuriate the minorities, that is, about 22 per cent of Moldovan citizens, add the anti-Russian propaganda and you see how the temperature within the society is growing. If it was not so, why we, as a neutral country, should extend so much joint projects with NATO? Why should we organise, one after another, joint exercises with NATO forces? Why have large sums been invested in modernising Bulboaca military base and the airport in Mărculeşti? We have already a Romanian-Moldovan battalion… In addition, the personnel of a NATO center in Chisinau enjoy full immunity, much greater than that of ordinary diplomats. They are excluded from any sort of responsibility for what they do within our borders, they can inspect any government institution they would like to and they can build whatever they like, uncontrolled. So far, they act moderately, claiming all the time that they were offering assistance to Moldova, nothing else. But here I ask: is NATO a benevolent organization? Are they going to build schools, preschools, roads? No, they have different objectives. More and more people understand that. And more and more Moldovans feel the spectre of war and they feel afraid. Polish journalist, expert in the field of Eastern Europe and the Middle East. 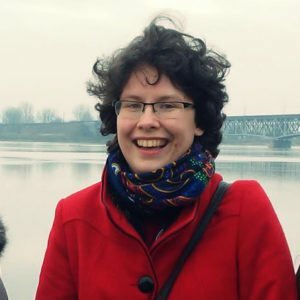 Deputy editor of the Polish left media platform Strike.